It has been two months since my surgery. It seems like it was forever ago, which can only mean that I am feeling great! I am so very thankful for that... since the whole thing was so much more than I had bargained for. Even though it was scheduled outpatient, I thought we might end up staying over night... but not three nights. I have been dealing with this urology issue for years... seven? Probably longer. It hurts to pee, and then there were times when I just couldn't. It is not fun to talk about or think about, but there it is. No one really knows why I have had all of this scar tissue build up, only that it is definitely a problem, and definitely on the unique-ish side. It got to a point where I was going every 3-4 months to have everything stretched out, and that was okay. Even though it was considered surgery, and I was under anesthesia, it was quick and easy. But one day my doctor told me that she had been to a conference, and and thought of me as she was listening to one doctor's lecture. He might be able to help me with a forever-fix. Procrastinator that I am, I waited six months to call him. I finally met him this spring, and we decided to start the journey. He is only one of ten doctors that perform this surgery, and even though I may have grumbled almost every time we trekked across Alligator Alley, I was also counting my blessings that he was only a two hour drive away. 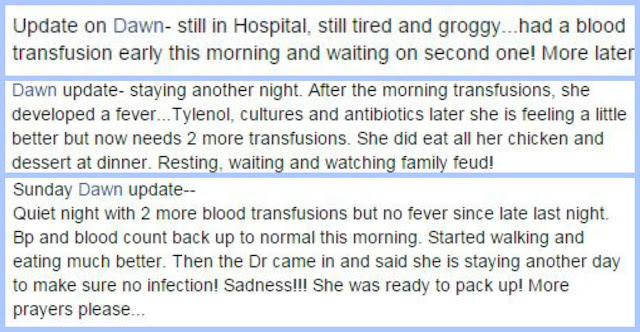 We arrived at the hospital, and while we were waiting to be checked in, Eric posted something to Facebook. I inwardly groaned, as I had only told a few people I was even going to the hospital, but I let it go. I had other things to think about. I don't even remember being in the recovery room. The first thing I remember was voices talking, while I was being rolled to a room in the hospital, and the overwhelming feeling of nausea. I couldn't even look around the room and see that my husband had a sofa bed and a chair until sometime the next day, I was just thankful he was there by my side. As for Facebook, I was also thankful. I think it kept Eric going... communicating with friends, knowing we were being prayed for. I would hear his phone beep, and he would update me on the newest message. He was also texting with several people, and it all just made us feel loved, and lifted up. And Kim, your long-distance nursing was a priceless gift! 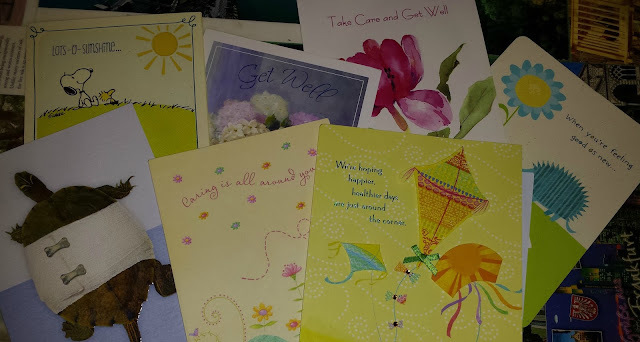 When I was finally able to read some, and respond, on Sunday, I was overwhelmed. Thank you, dear friends, for saying a prayer, for wishing us well, for walking along beside us. And Mom, I am not sure you can imagine what it meant to me that you came across the state to see me. Maybe my tears said it all, but you were what I needed. You are one of the two people in my life that help me breathe when I feel like I can't. I love you. Three nights and four days in the hospital is no fun... but the blessings, and the healing, have overcome. I still have a hard time imagining what you were going through; so thankful that Eric was beside you and kept us all in the loop. So happy you've healed and are HEALTHY again!!! Oh so sorry to hear how this all played out for you. 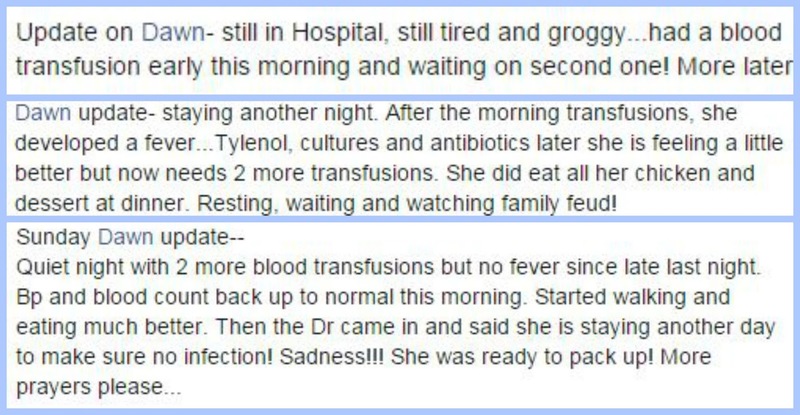 I have had those transfusions - such a strange sensation and thought - and grateful for them. You look to have a wonderful support system and many faithful who kept you in prayer. Thankful that you are well again! I hurt badly for you during your long journey. So glad you are healed and on the other side now! Sounds like the hospital stay was very rough! So glad you were lifted and carried through! Hugs and love, sweet friend!